HILLBURN–County and state officials met in Hillburn this week to announce that Rockland has been awarded $100,000 from the state to develop a plan to protect the Ramapo Valley watershed. The funds will be used by the Rockland County Water Task Force to assess the Ramapo watershed and make a plan to protect the Ramapo and Mahwah rivers as well as the streams that feed into the watershed. 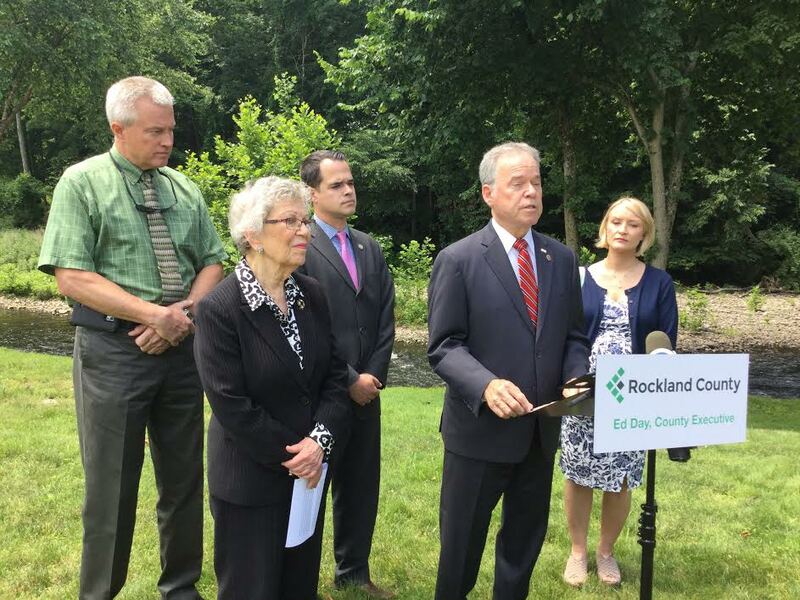 County Executive Ed Day was joined by Legislator Harriet Cornell, chairwoman of the Rockland Water Task Force and State Senator David Carlucci, who secured the funding as part of the state budget. The plan will also address flooding that has impacted surrounding communities and low water levels that are detrimental to water quality. The grant is in addition to $250,000 secured last year by Assemblywoman Ellen Jaffee and awarded to the Water Task Force to develop a water conservation plan. The county executive signed a resolution accepting that funding. He also urged residents to consider a new water conservation program that includes rebates offered by Suez, which supplies water to most of the county, and Orange and Rockland Utilities, for water and energy efficient devices. The $100,000 grant announced this week will enable the Water Task Force to hire an expert in watershed assessment to analyze and assess the Ramapo watershed and provide a management plan to protect and restore the rivers and the streams that feed into the watershed. The information from that report will form the basis of an action plan to protect source water and the health of waterways.